Day 2 of our tenth annual C3 Conference started off with a walk down memory lane. Executive Vice Chairman, Founder and Chief Strategy Officer Sid Banerjee took us through the inception of the company and how the Clarabridge product suite has evolved to help brands optimize customer data and transform experiences. After a look at how we got here, CEO Mark Bishof took the stage to discuss why customer insights really matter and what value they present to business. From finding and fixing common pain-points to reducing the amount of effort expressed, to identifying self service opportunities and more, CX professionals in the audience were inspired by the opportunities to maximize brand loyalty and drive business. And then they were motivated to put the products to use! Our Chief Product Officer (read: C3PO for this week), Fabrice Martin, discussed and demonstrated key updates to the Clarabridge platform that his team has been hard at work developing, and how clients can start implementing these products to reveal CX gold. We heard first from Beth Corso, Insights and Measurement Manager at American Family Insurance. Beth walked us through the creation of their first chatbot, and discussed why they’re looking to this channel to provide exceptional customer experience across the country. Her sage advice: when developing a bot, it’s important to train it to answer a slew of FAQs – but don’t stop there! After analyzing what types of questions customers take to the chatbot and when they’d like to speak to an agent, you’re better equipped to develop experiences that lead to faster resolution and happier customers. Amy Shioji, VP of Customer Experience & Insights at USA Today, also took the stage to discuss how understanding the customer’s voice has helped accelerate their digital transformation. As a daily destination for consumers, they’re constantly receiving feedback and have been able to turn that data into actionable insights and improvements. It’s resulted in lower cost-to-serve, increased digital engagement, and higher satisfaction and retention among new digital growth audience. Our post lunch presentation started off with a brutal truth: it’s rare (if ever!) that a customer calls to tell you how great your product or service is, right? Matt Esterman, Director of eCommerce Operations at LoanbyPhone talked about the value of training call center agents to make every customer experience better, even when they’re initially frustrated or angry. From detecting potential compliance violations to reducing dead air and unclear speech, LoanbyPhone is using Clarabridge to coach and improve customer service representatives. Throughout the day we heard Clarabridge success stories from customers HCSC, CIBC, SharkNinja and Adobe, and learned how the platform has impacted their businesses from the bottom up. Some expressed that even though it can be tough to gain executive buy-in for making changes to the CX program, it’s worth it! Starting with quick wins that demonstrate the value of using the contact center as an omni channel hub can help earn trust from key stakeholders and make the longer term strategic vision a reality. 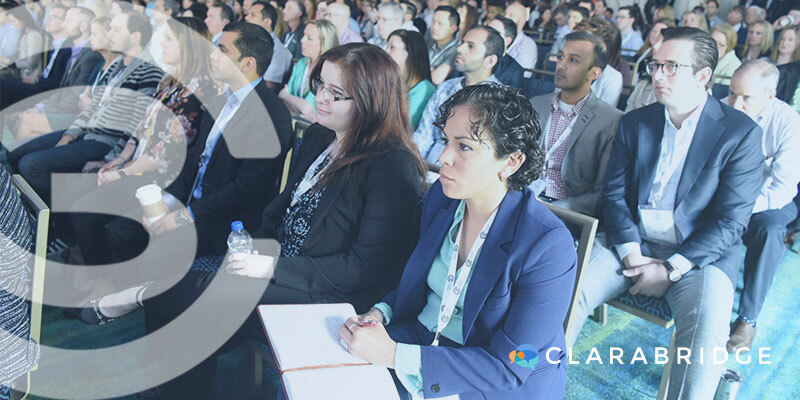 We also saw Clarabridge experts take attendees through best practices for current products and preview what the future holds. The energy and excitement from everyone in the room just kept building as they learned new tips and tricks. After an inspiring and productive day, we had an 80s themed party on the hotel rooftop with local D.C. cover band and C3 staple, The Legwarmers. We danced the night away in parachute pants, rock band T’s and a lot of neon. We even saw a pair of sneakers that lit up almost as bright as the Capital Wheel, and Sid as Michael Jackson, Thriller edition. It was a fun night for all, and we’re looking forward to another successful day!